French billionaire Bernard Arnault announced Tuesday that he and the LVMH luxury conglomerate he controls would give 200 million euros ($226 million) for the reconstruction efforts. The pledge came after Arnault’s crosstown rival Kering, the fashion group founded by fellow billionaire Francois Pinault, offered 100 million euros to help “completely rebuild Notre-Dame”. Paris Mayor Anne Hidalgo also said Tuesday that the city would unlock 50 million euros, and would propose holding an international donors’ conference in the coming weeks to coordinate the pledges to restore the gothic architectural masterpiece. The privately run French Heritage Foundation has already launched a call for donations on its website — www.fondation-patrimoine.org — while several pages were set up on the Leetchi fundraising portal. The Ile-de-France region comprising the greater Paris region is to provide another 10 million euros. Specialised craftsmen and rare materials are also expected to be needed to restore the monument, which welcomes more than 13 million visitors each year — an average of more than 35,000 people a day. The head of a French lumber company told FranceInfo radio that it was ready to offer the best oak beams available to rebuild the intricate lattice that supported the now-destroyed roof, known as the “Forest”. “The work will surely take years, decades even, but it will require thousands of cubic metres of wood. We’ll have to find the best specimens, with large diameters,” Sylvain Charlois of the Charlois group in Murlin, central France, told the radio station. The United Nations’ Paris-based cultural agency UNESCO has also promised to stand “at France’s side” to restore the site, which it declared a world heritage site in 1991. “We are already in contact with experts and ready to dispatch an urgent mission to evaluate the damage, save what can be saved and start elaborating measures for the short- and medium-term,” UNESCO’s secretary general Audrey Azoulay said in a statement Tuesday. The painstaking renovation work is likely to cost hundreds of millions of euros over several years, if not decades, though experts breathed sighs of relief that the damage was not even worse. But many officials were urging the government to mobilise the resources to quickly restore the cathedral. “Since yesterday I’ve been hearing that it will take a decade, what nonsense!” former culture minister Jack Lang told AFP outside the church on Tuesday. 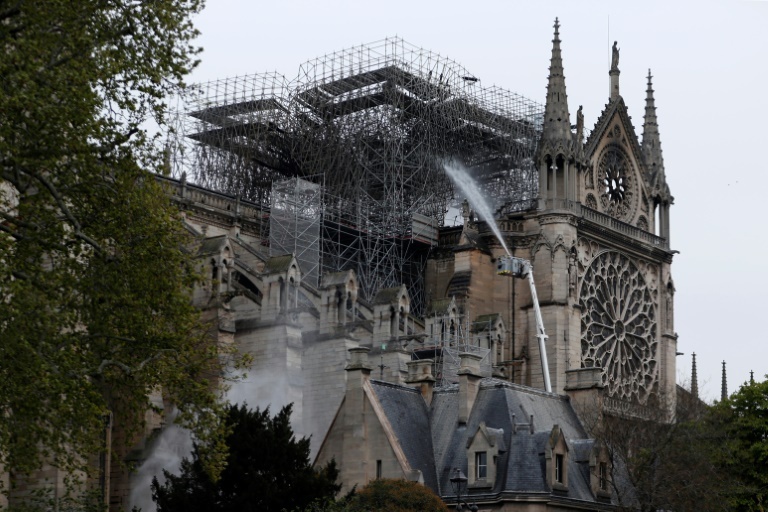 He called instead for an ambitious three-year project to rebuild the destroyed roof and its towering spire, which collapsed as a burning ember around two hours after the blaze erupted. “You have to set a short deadline, as we’ve done in the past with other exceptional works,” he said. Billionaires and private donors mobilise to rebuild Notre-Dame Borneo Post Online.